The California Dept. of Fish and Wildlife is proposing new saltwater regulatory changes to the Northern Management Area, which runs from Cape Mendocino to the Oregon border for 2017. These changes were established to bring state law into conformance with federal law for groundfish and other federally managed species. The changes — some good, some not so good — will allow more time on the water and open up more territory, but two of the main targeted species will see tighter limits. The toughest pill for saltwater anglers to swallow will be the reduction of the sub limit for black rockfish from five to three per day. The daily limit for lingcod will also be reduced, going from three per day to two. Anglers can still keep up to 10 rockfish per day, which includes a combination of rockfish, bocaccio, three cabezon and greenling. New for 2017, anglers will be allowed one canary rockfish per day, as federal fishery managers have declared canaries “recovered” from depleted levels just a decade ago. Petrale Sole and Starry Flounder will also be allowed year round and at all depths. On Dec. 26 at 12:01 a.m., the commercial Dungeness crab season will open from the Sonoma/Mendocino County line north near Point Arena and from near Shelter Cove to the north jetty of the Humboldt Bay entrance. The opener in this area will be preceded by a 64-hour pre-soak period starting at 8 a.m. on Dec. 23. For more information on all the upcoming openers, visit more-of-commercial-dungeness-crab-fishery-to-open-one-area-will-remain-closed/. According to Reginald Kennedy of Eureka’s National Weather Service, the next storm is forecasted to arrive on Thursday late in the day and will likely stick around through Friday. This will be a colder system, with the snow levels dropping to 3,000 feet. We’ll likely see one to two inches of rain in Del Norte and Humboldt counties and up to three inches in the higher elevations. The showers should taper off by Saturday morning, and we’ll likely be dry through Monday. A weak system is forecasted for Tuesday, but it probably won’t do much to the rivers. The light rain could accumulate to a quarter or a half-inch. Dry weather is back on tap Wednesday and should stick around through Saturday,” Kennedy added. In its fourth year, this annual fishing contest is held on three watersheds during the “Peak of the Run,” from January 1 to March 31. Anglers who register for the contest plus catch and photograph a steelhead on the Mad, Trinity, and Eel Rivers will have a chance to win cash and prizes from several local outdoor stores. This year, HSD will offer special bank access near the Mad River hatchery courtesy of Green Diamond Resource Co. Access is limited and permits are required. 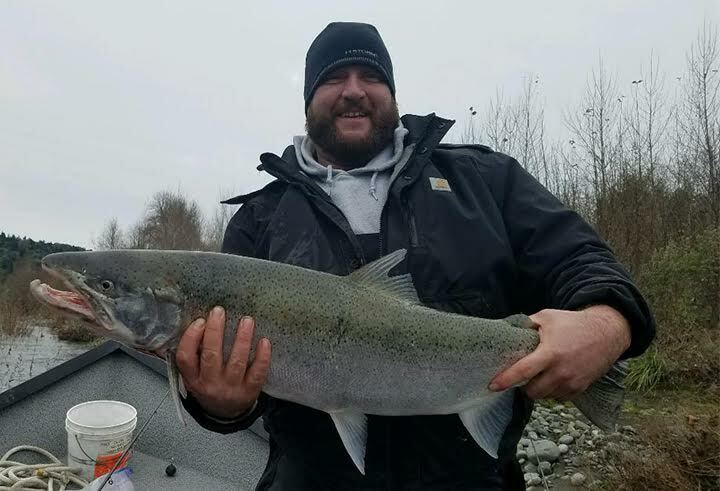 HSD has grown from a two-week event into a three-month-long celebration of all things steelhead with not only fishing, but also many events and angling activities organized throughout Humboldt. These events are designed to create awareness and further promote restoration and recovery of Humboldt’s winter Steelhead populations and their spawning habitat. Some of the family-friendly events include spawning and restoration tours, steelhead themed expos, rigging and casting classes and the International Fly Film Festival (IF4). 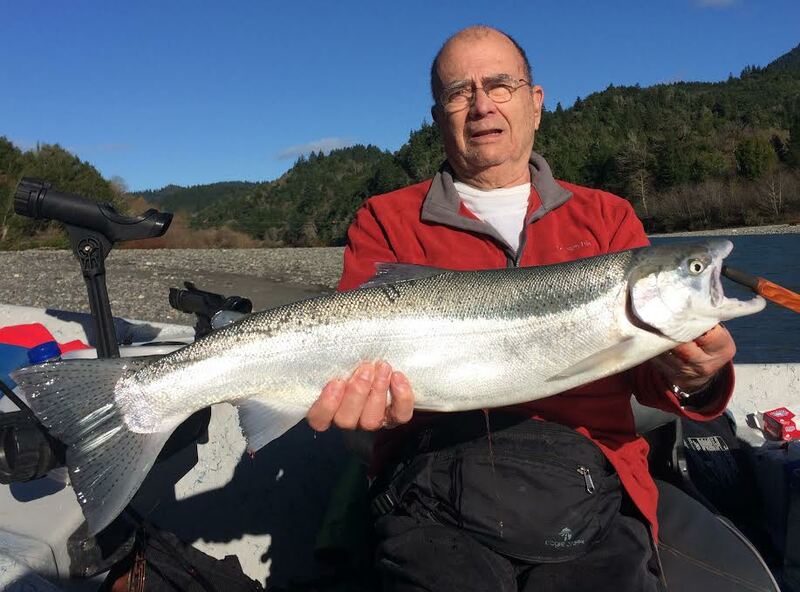 This year, organizers are heavily promoting several lodging discounts throughout Humboldt if anglers ask for the Humboldt Steelhead Days rate when booking. To register for the contest, you can sign up for $10 at these outlets: Pacific Outfitters, RMI Outdoors, Mr. Fish Seafood in Eureka; Mad River Tackle and Wildberries in Arcata and Sport & Cycle in Fortuna. You may also register online at humboldtsteelheaddays.com or email them at Humboldtsteelheaddays@gmail.com. The Mattole River will open to fishing on Sunday, January 1 from 200 yards upstream of its mouth to the confluence with Stansberry Creek. Only artificial lures may be used and barbless hooks are required. The Mattole is also regulated by low flow closures, with a minimum flow of 320 cfs at the Petrolia gauging station. The water running down the ladder to the river was turned on Monday and a few fish had already made their way up as of Tuesday. The hatchery hopes to begin spawning on Tuesday, Jan. 3. Steelhead season has started slow on the Smith, with a few being landed by bank anglers plunking last Saturday. The drift boats caught a few fish on Sunday, but it’s been slow since. You can expect the steelhead fishing to pick up as January is traditionally a really good month for the Smith. River levels are predicted to rise a couple feet on Friday, but should be fishable by Saturday. All were headed down towards fishable level, but Friday’s rain will set them back a few days. With very little rain in the forecast after Friday, these rivers could drop back into fishable shape by midweek. The main stem Eel will likely take a few days longer and could fish next weekend. For river level predictions, visit cnrfc.noaa.gov.